The number of foreign nationals (refers to foreign defendants) convicted in a court of first instance in 2009 was 5,159 (down 9.1% from the previous year) and its proportion to the total number of convicted persons was 6.9% (Source: Annual Report of Judicial Statistics). 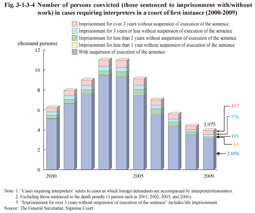 In 2009 the number of persons finally disposed in cases requiring interpreters (refers to cases in which foreign defendants are accompanied by interpreters/translators; hereinafter the same in this subsection) was 4,085 (down 9.4% from the previous year). 38 different languages were used in those interpretations; in descending order of frequency, Chinese for 1,265 defendants (31.0%), Korean for 467 (11.4%), Portuguese for 446 (10.9%), Tagalog for 431 (10.6%), and Spanish for 272 (6.7%) (Source: The General Secretariat, Supreme Court). Fig. 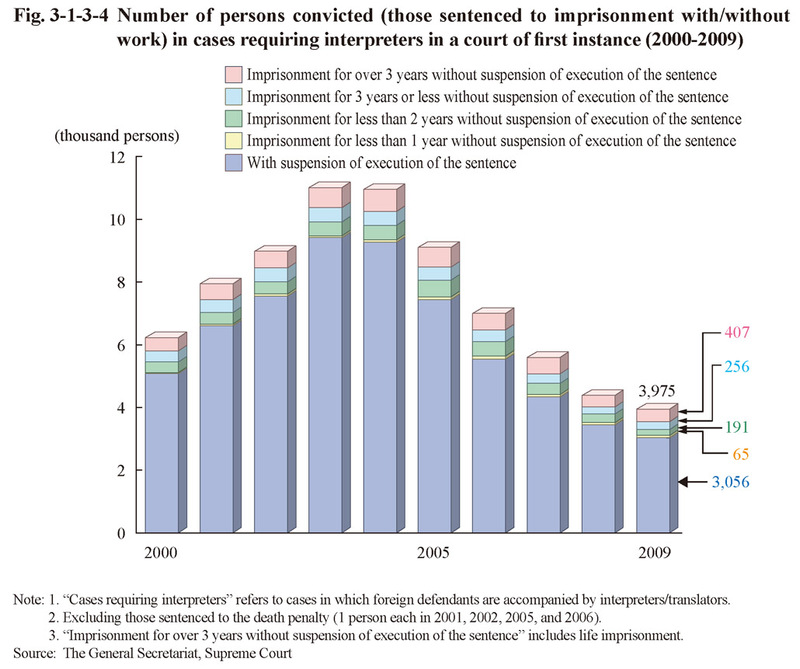 3-1-3-4 shows the number of persons convicted and sentenced (limited to imprisonment with or without work) in a court of first instance in cases requiring interpreters over the last 10 years. The number of persons convicted has been decreasing from 2004 and was 3,975 (of which four were sentenced to life imprisonment) in 2009. The suspended execution rate was remarkably high at 77.0% when compared to that of Japanese (58.3%). This is due to the fact that the suspended execution rate for Immigration Control Act violation cases requiring interpreters was significantly high, accounting for 93.5%. The suspended execution rate of cases requiring interpreters excluding Immigration Control Act violations was 67.2% (Source: The General Secretariat, Supreme Court).